An Islamist organization sympathetic to the Muslim Brotherhood is warning all foreigners and diplomats to flee Egypt by the end of February or face becoming "a target by the Revolutionary Punishment Movement," according to a recent warning posted online by a Brotherhood-affiliated site and read live on television by one of its broadcast organs. The statement issues a threat to "all foreign nationals," "all foreign companies," and all "embassy foreigners, diplomats, and ambassadors," ordering them to leave Egypt by the end of the month or face violent attacks, according to an independent translation of the Arabic statement. Foreign travelers also are warned to "cancel their trips" and told "they are not welcome to Egypt during these difficult days." 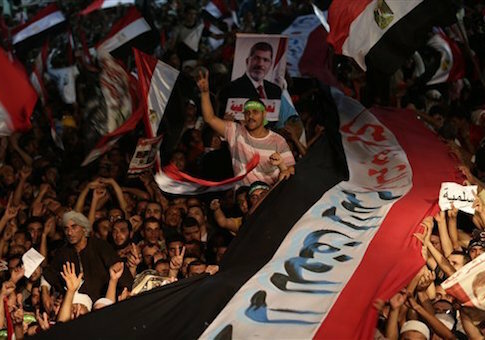 The warning comes just a week after Brotherhood leaders and allies were hosted for a meeting at the State Department, which drew fierce criticism from the Egyptian government. It also follows a similar statement by the Brotherhood urging its supporters to prepare for a "long, uncompromising jihad" in Egypt. The latest threat was issued by an anti-government group identifying itself as "The Youth of the Revolution." The statement was published late last week on a Brotherhood-affiliated Facebook page and also read on a Brotherhood-affiliated television station operating out of Turkey. "After the successive meetings with revolutionaries in the squares, we decided with all the Revolutionary Punishment Movement the following," the statement reads. "All embassy foreigners, diplomats, and ambassadors, are given a deadline until Feb. 28 to leave the homeland," it states. "All foreign nationals, from all foreign, Arab, and African nationalities and all employees with companies working in Egypt [must] leave the country immediately," it says. "This deadline will end on Feb. 11, 2015, and after that they will be a target by the Revolutionary Punishment Movement." Foreign companies "working in Egypt" are instructed to leave by Feb. 20, "withdraw their licenses in Egypt and end their work, otherwise all their projects will be targets by revolutionaries." The revolutionary youth group also instructs any country supporting the government of Egyptian President Abdel Fattah al-Sisi to withdraw its backing. Like the Brotherhood, the "The Youth of the Revolution" does not recognize al-Sisi as the rightful Egyptian leader and seeks to reinstall as president ousted Brotherhood ally Mohamed Morsi. "All countries supporting the coup and assisting it monetarily and politically must immediately cease from any support to the coup within a month from this statement otherwise all their interests in the Middle East will be exposed to severe attacks that will have dire consequences," the group warns. Following the Washington Free Beacon’s initial report on the meeting between the State Department and Brotherhood-aligned leaders, the Egyptian foreign minister lashed out at the Obama administration, calling its policies "incomprehensible." State Department spokeswoman Jennifer Psaki was forced to admit that she initially misled reporters about the meeting. Psaki claimed that the trip was organized and funded by Georgetown University, a claim the university denied when contacted Monday by the Free Beacon. Psaki was forced to correct the record at a briefing Monday with reporters. "Unfortunately, I didn’t have the accurate information on one small piece. The meeting was set up by the Center for the Study of Islam and Democracy, a nonprofit. So the visit was not funded, as you know, by us or the U.S. Government, but it was also not funded by Georgetown," Psaki said. However, she continued to defend the decision to meet with the delegation. When asked by a reporter, "is the building comfortable with continuing to do business with this center, this group," Psaki responded, "Yes. Yes." Terrorism analyst and reporter Patrick Poole said Brotherhood offshoots such as this youth group have become increasingly violent as the Egyptian government continues its crackdown on the Brotherhood and terrorist groups. "For a year and a half we've seen these Brotherhood youth cadre offshoots grow increasingly violent, whether it is the ‘Molotov Movement', ‘Revolutionary Punishment Council', or whatever name they operate under this month," Poole said. "Initially it was targeting police and military personnel, then violence at the universities and civilian areas. So it's no surprise now that they're going after foreigners." Brotherhood leaders have quietly endorsed this violent rhetoric, he said. "The Brotherhood leadership, the vast majority of which is now either in prison or in exile, has nurtured this culture," Poole said. "They train for it and justify it in their indoctrination curriculum. And as the call for a new phase of all-out jihad published on the Brotherhood's official website last week indicates, this latest threat of violence can be seen as a direct response to what the leadership openly called for just days before." This entry was posted in National Security and tagged Abdel Fattah al-Sisi, Egypt, Jen Psaki, Mohamed Morsi, Muslim Brotherhood. Bookmark the permalink.